1. using magnetic induction hall devices to stroke control, non-contact work, never wear offset. 1. non-uniform motion, fast start, slow stop, run more smoothly. 1. Barrier type: colors of straight type can be chose. 1. 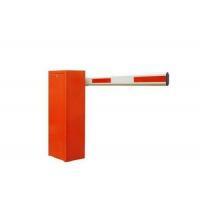 This barrier gate is widely used for the facilities of parking lots, traffic or toll system, we don’t suggest for high way and other heavy duty application. 2. Arms can be chosen from 2 meters to 6 meters. 3. Manual handle can be used to open the arm in case power off. 4. All the process is soft without any noise and shaking. 5. This barrier gate has many input terminals for photocell, Airwave switch, loop detector, LED light bar, toll gate system and output terminals for flashing light. 2 Broken by improper voltage. We are professional and leading BARRIER GATE manufacturer, founded in 2008.
the gate run speed, length of arm, power source or other specials you give us will be more appreciated. c. Sample confirmation---sample will be shipped out in 2 days. d. Payment terms--- T/T 100% advance payment. PaypaL, Western union. f. Shipping--- by sea, air or courier. Detailed picture of package will be provided. 1. Packaging Details:Packaging by wood boxesand paper cartons. 2. Delivery Detail: 2-15 days.